Professor Layton is back! Well, it’s actually his daughter Katrielle this time around. But other than that, Layton’s Mystery Journey is the return of everybody’s favorite London-based puzzle adventure game series. Here are my first impressions, about 5 hours in. Mystery Journey is available for iOS and Android today, with a 3DS version coming to America later this year. First things first: If you’ve played any of the six previous games in the series, you know almost exactly what to expect. Development studio Level-5 has made no substantial changes to the Layton loop. You explore London by pointing and clicking, talk to the wacky residents of the town to solve a good wacky mystery, and discover a couple hundred logic puzzles along the way. 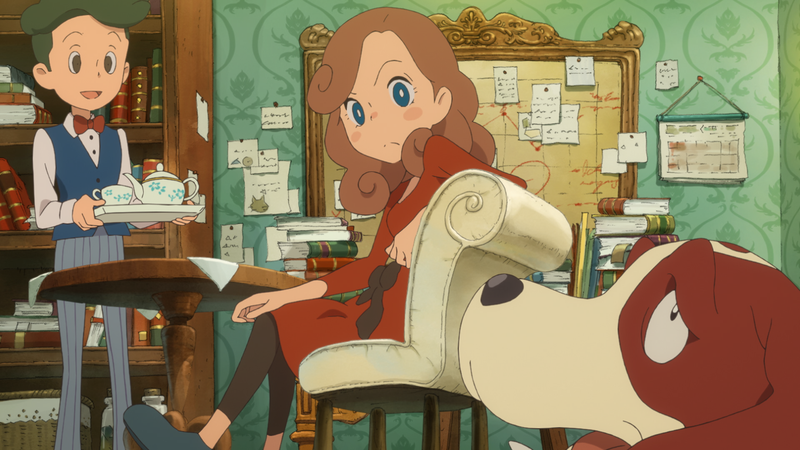 Unlike her dad, Katrielle Layton isn’t a professor of archaeology who dabbles in solving mysteries; she’s actually a detective by profession. This shift from avocation to vocation brings with it a slight change in the flow of the game. Rather than solving one massive mystery that takes the cast all over the world, Katrielle solves a series of smaller mysteries brought to her by her London clients: a missing cat, a stolen piece of a movie’s film reel, et cetera. The gameplay, then, revolves entirely around poking at the various pieces of scenery to find puzzles, then solving them. You also occasionally find coins that you can redeem for hints when you’re stuck. The puzzles are mostly unconnected to the plot of the game, and if you’ve ever perused a book of pencil-and-paper logic puzzles, you’ll have encountered many of them before. Magic squares, moving matchsticks, algebra word problems, lateral thinking puzzles, &c.
I’ve solved around 50 puzzles so far and have found them, as a group, to be weak tea at best. Layton puzzles are at their strongest when they’re about lateral thinking—you ponder the wording of a puzzle or the arrangement of a mysterious picture until you get that a-ha! moment and an inscrutable imponderable instantly makes sense. So far there hasn’t been much of that in Mystery Journey. The puzzles I’ve solved have involved a lot of rearranging shapes, plotting out pathways, and other sorts of play-with-the-pieces puzzles. They’re already starting to get repetitive. Some of the logic puzzles are so ridiculously easy I wouldn’t even call them puzzles. One puzzle is written in such a way that there are two viable solutions, but the game only recognizes one of them as being correct. It could be because I’ve already played six Layton games plus the Phoenix Wright crossover, but I’m not impressed by the puzzling so far. It all just feels a little loose and sloppy, a little underwhelming. The script is a high point. While those previous Laytons were localized by Nintendo, this one was handled by Level-5 itself, and specifically by noted translator Richard Honeywood, who did Ni no Kuni and various Dragon Quest titles. If you’ve played those, you’ll find Mystery Journey’s rich British accents and wordplay-heavy comedy quite familiar. The writing is playful and funny, and the characters all have distinct ways of expressing themselves that clearly define their personalities. The only drawback is that Honeywood seems to be in a Worst Pun contest with himself as regards the characters’ names. An independent filmmaker is named Maverick D. Rector. His editor’s name is Eddie Torre. And the projectionist who shows the picture is Seymore Frames. In case you do miss Layton the elder, there’s actually a top hat costume that you can dress Kat up in, as well as a variety of other costumes. This is the key difference between the mobile game and the eventual 3DS version: While the 3DS game will cost more and be content-complete, the mobile game costs $15.99 and is missing many of the costumes. You can buy them for $1.99 each, and they each include a bonus puzzle. Otherwise, though, you’re getting the whole game for sixteen bucks. The mobile phone version pretty much feels like they took a 3DS game and hacked it onto a phone. You play vertically, with the phone screen split in two: the non-touchable dialogue and scenery at the top and the “touch screen” at the bottom, as if it were a 3DS layout. You drag your finger around the bottom of the screen to move the magnifying glass at the top, sort of like using a touchpad and a mouse cursor, rather than directly tapping on the objects of interest. On the one hand, it’s nice having the unaltered 3DS version on your phone because you know you’re getting the same experience on mobile as you always had on Nintendo platforms. On the other, there’s some weird kludgey stuff they’ve done to make it work. For example, when one of the game’s many fully-animated video scenes starts playing, you have to rotate your phone horizontally to watch it. You can set it to play the videos vertically, but then they’re displayed in full widescreen format on about one-quarter of your phone’s screen. You also have to manually save the game, which is not typical of mobile games. Don’t forget to save before you swipe up! Level-5 says the 3DS version will arrive “as soon as” October, meaning the release date isn’t set yet. I would have to imagine that playing Mystery Journey on the 3DS will be a more comfortable experience. Moving puzzle pieces around with a stylus is more pleasing than using one’s finger, and the graphics seem like they were designed for 3DS and moved to mobile afterwards. But then again, if you get the mobile version you can have it now, and for much less money up front. What to do, what to do? Which version to get? This is perhaps the greatest of Mystery Journey’s puzzles. I’ve only had a few days with the game, and will need more time to form a more comprehensive opinion of it. For now: I enjoy the story and the writing, but am ambivalent about the puzzles. And smartphone or no, it’s a real Layton game no matter which way you slice it.